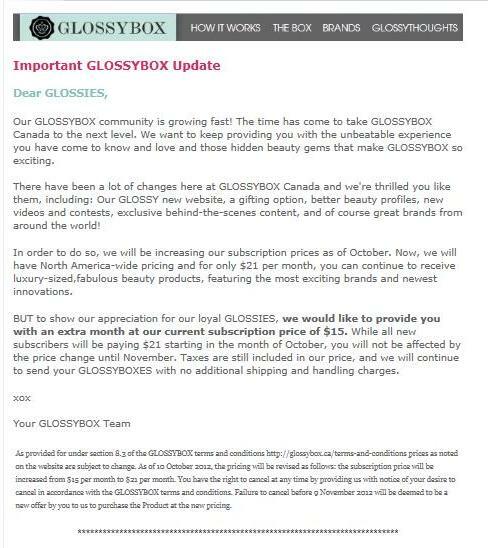 I received an email this morning from Glossybox.ca regarding a price increase to the monthly subscription effective October 2012. The price will increase $6 from $15 to $21/mth. Glossybox calls this North American pricing that will put us on par with the American version. With the idea being that we will also get the same quality products as the American version. Glossybox.ca has offered their existing subscribers a discounted price for the October Glossybox. We will get the October box at the old rate of $15 but come November everyone pays $21. Glossybox is one of my favorite boxes. I am a little sad at the price increase but it is my hope is that the box will bring us more cosmetics and quality beauty samples. Currently the website still states $15 for a monthly subscription with shipping probably being between Oct 10-16th. Some have been vocal about the price increase on the Glossybox.ca facebook page. I will reserve my opionion after the next few boxes. But I am glad I didn't use my glossydots on October. I will save them for November. I do have a promo code Glossy27 to save 10% off your first order. What do you think of the price increase? Good, Bad or Indifferent? I was pretty upset about the price increase as well. I just started my subscription to TopBox finally, so I'll see from there! The american glossyboxes are usually very nice though! I cancelled my Glossybox subscription right when I saw the price increase! With TopBox costing $11.30, the new $21 Glossybox just seems crazy. I was loving Glossybox, but $21 is just too much for surprise products; some of which I have no use for. I was really angry when I got that email. Considering this month was the first at $21 for new customers, I don't feel as though there was an increase in product quality. Sure, they may have included some $90 cream, but the sample is SO small, that it's just silly. Likely cancelling after 1 more. I can't support a 40% increase in price. I am debating whether or not to keep this box too. I will give a few months but I figure I can save the $21 and buy something I really want. Glossybox is one of my favorites boxes but the price increase is not. It just seems weird that all the major boxes have had a recent price increase. I guess competition for sponsors is getting costly?